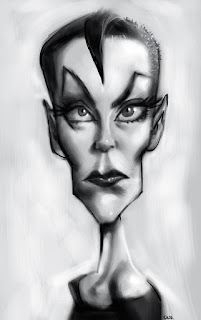 Of course this isn't how she looked when she played Vampira but I came across this photo of her that looked very cool and was compelled to draw it. I also found out she apparently had a 17 inch waist when she was playing the character. That's ridiculous. I was going around the house trying to figure out how tiny that is. It's much thinner than my head, it's even thinner than my cereal bowl. Apparently she didn't eat for two days before the show and used to go to Turkish baths to keep the weight down. Obviously it was very important to her but the article didn't explain why.